These 3 auspicious animals are popular in the Chinese community. They look similar but with different functions and characters. Below are some of their basic application in Feng Shui. Turtle is a symbol of support, long life, stability, and power. It is not as fierce as a dragon or lion but can bring support and energy without direct fighting. It is gentle and slow, but steady and positive. In the area of the house that needs support, you can place a sculpture of a turtle to boost the energy there. For example, if you have missing corners or lack of a proper backyard. It can also reduce the exterior “Sha Qi” when facing the front door or window. Dragon turtle has both advantages of a dragon and a turtle. It can be placed facing out of the front window or door to counter the negative “Sha Qi” nearby. For example, if the road is leading straight to the front door, a sharp angle pointing to the house, or “Yin” types of buildings such as temple, cemetery, jail and so on. Dragon turtle can be a remedy to balance out the nearby Sha Qi. Dragon Turtle can also bring career advancement and success. It can reduce the backstabbing or gossiping, and attract helpful people. Since the dragon is the male energy. You can place the Dragon Turtle sculpture on the right side (the male energy side) of the office desk for business luck and increase the authority. 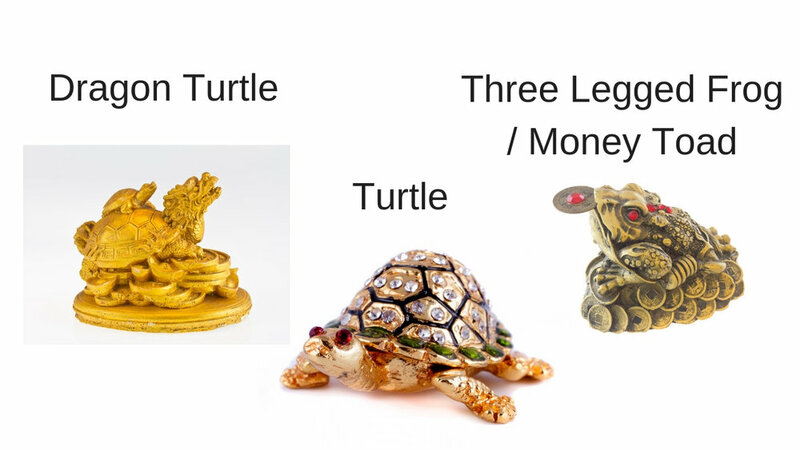 Dragon turtle can also bring money luck when placed in a money section of the house, or near a water feature. This is the classic money-making Feng Shui cure. It is said this legendary toad has only 3 legs, keeps spitting out coins to the owner, and never leaks any money. This sculpture is best to be placed facing indoor so the money does not go out of the door. Since it is related to money, it is best to place the three-legged frog in a money corner or money section of the house. Adding a money jar with real money can enhance the money Qi too. Understanding the basics of a Feng Shui Lo Pan compass. Common bedroom Feng Shui mistakes and the 21-point checklist for a holistic design. There are always questions and concerns when practicing Feng Shui. We try to answer some common questions in this article.